GigaOm is seeing a new breed of services that promise to accelerate the mobilization of existing enterprise applications and business processes. Early mobile-application development solutions (MADP) were resource-intensive, requiring custom client code for each supported platform, as well as an on-premise middleware layer to connect mobile clients to enterprise backend systems. In this new model, code-free, configuration solutions - aimed at business analysts and lines of business- are revolutionizing the landscape, consolidating tools and services to simplify cross-platform enablement, and reducing time to deploy and cost tremendously. 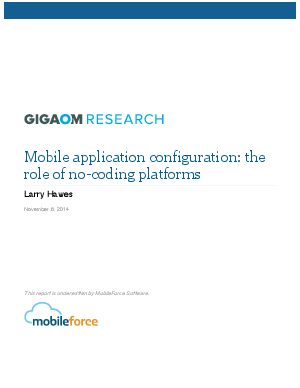 This report describes mobile-application configuration (MAC) tools, articulates their business value and suggests conditions under which they may be a good choice for an organization.